little green love: We Can Do It! The last Halloween that I wore a store bought costume I was 2. My mother was great and would rummage through her closet to transform me into Cleopatra, a punk rocker, or a lady wrestler in under 10 minutes. On a thrifting trip in August I spied a pair of brand new coveralls relatively close to my size. I was a little hung up on their high price tag, $12.99, but once I had the vision it couldn't be ignored. 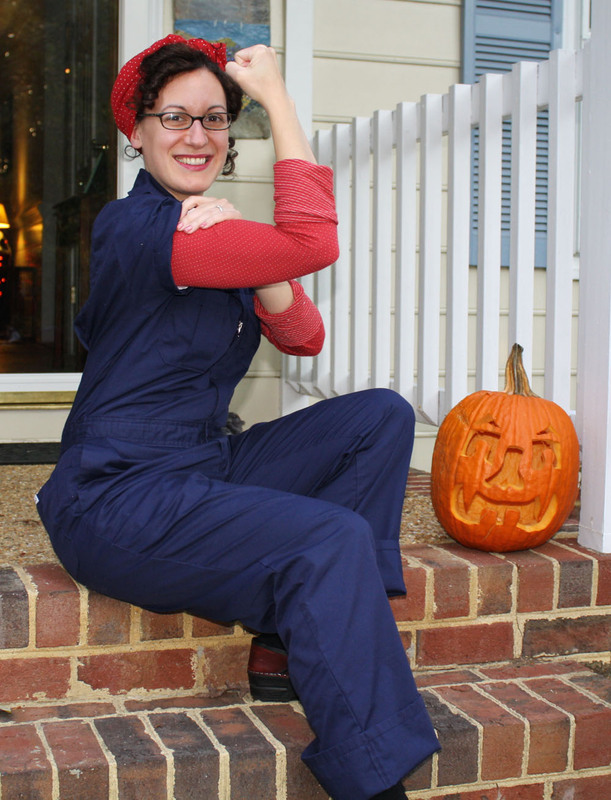 I had to be Rosie the Riveter. Sorry to deny you the pleasure of seeing my actual bulging bicep but I was a little chilly. I had to do some simple alterations for a better fit which included taking in the waist (this sounds hard but I cheated.) I made a quicky head scarf from scrap fabric in the studio, set my hair on curlers and hit my nails with some vintage looking pale pink polish. I searched through my collection of punk pins looking for something that would do the costume justice and I almost couldn't believe what I found. Pinned to the right side of my collar was a pink pin that read : A woman's place is everywhere. Rosie couldn't have said it better herself. I absolutely love your costume! I knew exactly who you were before ever reading your blog entry! Good job! My grandmother, while not a riveter, was part of the mass of women who went outside the home to work while my grandfather served in WW II. What a qonderful costume! Hi, I'm Ono. Sewing and repurposing rule my life. My little family and I have a fixer-upper home on a fixer-upper acre. We hate to buy something that we can make and so our home is always bustling. This blog is about all of that making..and other things.